GameInformer is winding down its month long coverage of Transformers: Fall of Cybertron that comes out late next year. The three latest articles provide a look at Jazz; provide a Hasbro approved Timeline and a look at how High Moon Studios is protecting the Transformers license. The image to the left is a timeline (if stretch classical use of the term) of High Moon's video game story and hints at what the third game may focus on. The main takeaway is this is Hasbro's official canon for the Transformers. 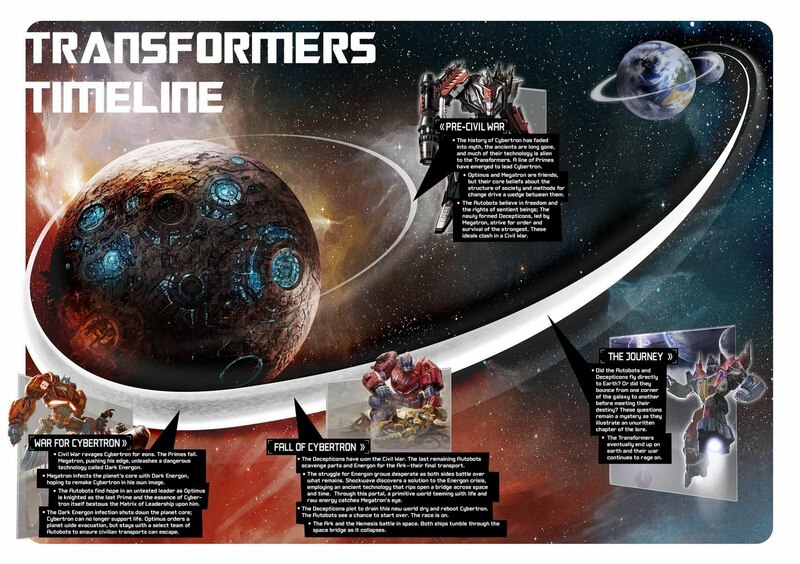 In theory you could have a line from Earth to details about Transformers: Prime and possibly Transformers: Universe. Hopefully High Moon releases that awesome art Cybertron as standalone wallpaper. 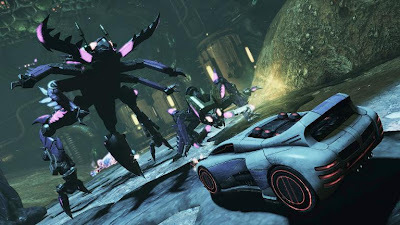 Jazz will be one of the central playable characters in Cybertron, whose design is strongly inspired by his Generation One look and personality. This extends to his Cybertronian vehicle mode that is very similar to his G1 earth bound look, complete with spoiler. One of Jazz's special weapons include a grapple, allowing him to move above the skyline, almost like a Spider-Man or Batman level but simplified to retain focus on the action. This compliments his other weapon, a sniper rifle, which allows him to take out enemies at a long distance. More details can be found here. The last article is a look at how High Moon Studios and Hasbro worked together to help create two games that give homage to the Transformers many of us grew up on while moving the franchise forward. In the interview with game director Matt Tieger and Hasbro VP Aaron Archer, they discuss how the two companies came together to help create the first game. That can be found here.